Pain – What is it? Can I help you with your health & wellness content? Fibromyalgia is a common syndrome in which a person has long-term pain, spread throughout the body. The pain is most often linked to fatigue, sleep problems, headaches, depression, and anxiety. chronic widespread musculoskeletal pain, stiffness, and tenderness to palpation at specific TPs. We used to think that pain was a signal from an injured tissue sent up to the brain. We thought that that pain signal was proportional to the amount of injury. But what is the use of pain? Why should we experience it? This is shown in examples of people with “phantom limb pain”, where pain is felt in a limb that has been amputated. This is also shown when people with serious injuries don’t feel nearly as much pain as you think they should. In fact, when I was in prenatal classes we had to do a pain experiment to help prepare for childbirth. And you can do this too – all you need is a watch/timer and two ice cubes. We had to spend as long as possible holding an ice cube in our hand. The first time we were thinking about that ice cube. Focusing on that ice cube. Wishing the ice cube was not freezing our palms. I don’t think we lasted more than 30 seconds. For the second part of the experiment we had to do the exact same thing – but this time were thinking about being in our favourite place, with our favourite people. Focusing our attention on our lovely thoughts (of a beach, perhaps). I was very surprised at how much longer I could hold the ice cube when I wasn’t thinking about it wishing things were different. Focusing on it made it less bearable. Most people only have a limited ability to “think” themselves out of pain. So, how much influence can your mind have on your experience of pain? 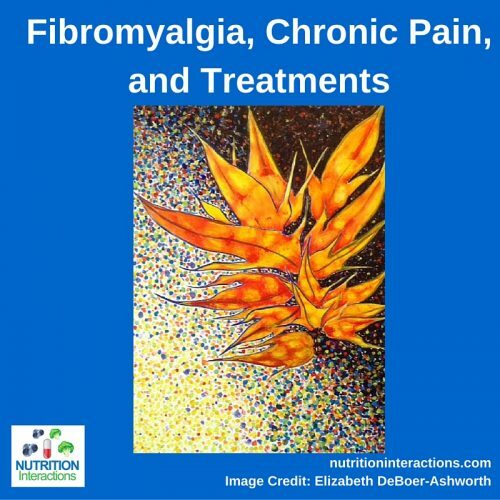 There is a lot of research and a lot of theories as to how the spinal cord and brain process stimuli differently in people with fibromyalgia. This is where all of the different medications come into play. Medications used for pain are often analgesics such as acetaminophen and NSAIDs. There are others as well. Definitely speak with your doctor and maybe consider referring them to reference (2) Disease-a-Month – Fibromyalgia and/or reference (6) 2012 Canadian Guidelines for the Diagnosis and Management of Fibromyalgia Syndrome. If you are taking medications, please know which supplements they are known to interact with. Make sure your prescribing doctor and/or the pharmacist know any complementary and alternative approaches you are using. People use other approaches as well. Leesa Klich, is a health writer and content strategist for busy wellness professionals. She translates the science of health and wellness into understandable and fun articles. You can download a free copy of her ebook “The Real Deal About Calcium and Your Bones” on her website at leesaklich.com. Need an awesome piece of scientifically-referenced content for your health and wellness website? You can check out some samples in my portfolio here, instantly download (and upload to your website) some pre-written “done for you” posts here, or if you’re ready for professionally written content customized for your business, click here. How can online health & wellness pros build blogging confidence? 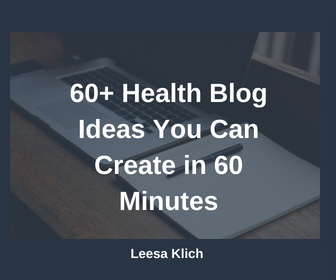 Leesa Klich is a Health Writer, Blogging Expert, and Research Nerd. She loves helping health & wellness professionals strategically use credible research-based blogging to build their businesses.